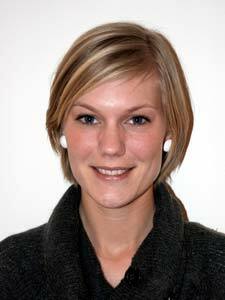 In a recent Article in Nature Cell Biology (journal impact factor 20.76), PhD student Sigrid B. Thoresen and her co-workers in Harald Stenmarks group at Institute for Cancer Research and Centre for Cancer Biomedicine have uncovered a cellular mechanism that prevents completion of cell division if "lagging" chromosomes are detected in the bridge between the two forming daughter cells. This prevents occurrence of cells with abnormal numbers of chromosomes, aneuploidy. Since aneuploidy is strongly associated with cancer progression, these results open new possibilities for future cancer diagnosis and therapy. Previous studies have shown that a cellular checkpoint termed NoCut is activated to halt cell division until lagging chromosomes are removed from the intercellular bridge, and that the protein kinase Aurora B is a central activator of this checkpoint. The mechanism whereby Aurora B halts cell division has remained unknown, except that phosphorylation of a protein found in the intercellular bridge, CHMP4C, is important. Thoresen and colleagues have now identified a novel protein, called ANCHR (abscission/NoCut checkpoint regulator), that provides the missing link between Aurora B and the molecular machinery that mediates abscission. In co-operation with Aurora B-phosphorylated CHMP4C, ANCHR anchors a key mediator of cellular abscission, VPS4, at the so-called midbody ring, a protein-rich structure in the middle of the intercellular bridge. Upon inactivation of Aurora B, ANCHR lets go VPS4, which is then free to migrate to the abscission zone a small distance from the midbody ring to complete abscission (see Figure). If ANCHR is inactivated experimentally, dividing cells fail to arrest in response to lagging chromosomes, and this results in daughter cells with abnormal chromosome numbers. In future studies the authors plan to collaborate with translational cancer researchers in Centre for Cancer Biomedicine to investigate possible connections between ANCHR dysfunction and cancer. This article is part of Sigrid B. Thoresens PhD thesis Novel regulators of the cell division cycle, which she successfully defended for the PhD degree on May 9th. Model for the ANCHR-mediated regulation of VPS4 upon abscission checkpoint activation. 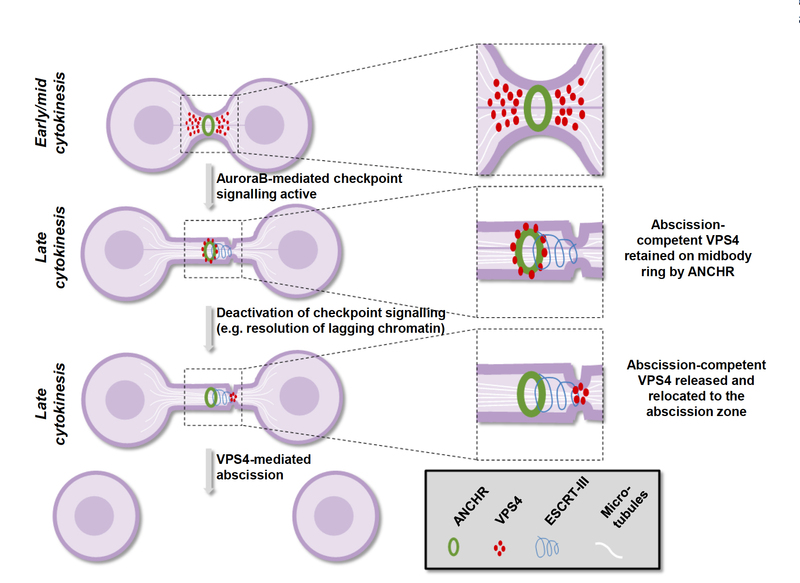 At late cytokinesis, until abscission checkpoint signalling is terminated, ANCHR and CHMP4C retain abscission-competent VPS4 at the midbody ring. Upon deactivation of Aurora B, dephosphorylation of CHMP4C results in the dissociation of an ANCHR-CHMP4C-VPS4 ternary complex. This release could allow VPS4 to subsequently migrate to the abscission zone to mediate the final stages of abscission through its effects on filaments formed by ESCRT-III.